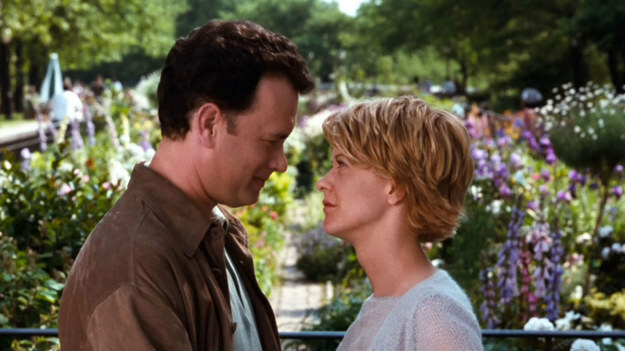 This weekend, my family and I sat down to watch a film I remember loving when I first saw it in my late teens: You’ve Got Mail starring Meg Ryan and Tom Hanks circa 1998. We have three children, all in their early to mid-teens, and were searching for an upbeat family movie that everyone could enjoy. I settled into the couch with hubby and kids expecting what I remembered from my youth: A lively romantic comedy with pithy conversation and beautiful shots of NYC life. What I saw, now that my mind is one of a mother (i.e., with a ticker tape running through my brain trying to determine if I’m raising my children to be good citizens of the world), was a very different movie. One that I wasn’t sure I was OK having my kids watch, when it came right down to it. First off, just to give you some context: Tom Hanks and Meg Ryan play competing booksellers (his is the huge corporate book store and hers the struggling independent) who have unknowingly started a friendship online via AOL email while dating other people. Much hi jinks and arguing ensue until they, not surprisingly, happily end up together. Here are my issues, as a mother regretting she suggested this as viewing enjoyment to her children, in somewhat order of annoyance and/or disappointment. Both of the main characters are already in relationships with people who they show no real affection or consideration for. In fact, they appear to actively dislike their chosen romantic partners, despite living together (or, as Meg puts it in the film, practically living together). Why be in a relationship with someone you can’t stand to be around and, as a result, go off seeking connection elsewhere instead of just leaving the dissatisfying relationship to begin with? Meg asks for (and receives) lots of advice from Tom, via both e-mail and in-person discussions (they become friends in a backwards sort of way towards the end before Tom’s big reveal). Tom offers this willingly and with great panache. Advice you say? I’ve got some of that! But, throughout the entire movie, Tom never once asks for advice from Meg (despite the fact that his character is the one who has some growing and maturing to do, according to every romantic comedy cliche ever written). Which brings me to. . .
3. Tom’s character never changes his ways. One of the main conflicts in the film is that Meg loves the process of owning a bookstore and connecting with the community, while Tom is just in it for the money. At the end of the movie, Meg’s store has closed and Tom’s store is thriving. But, more importantly, his store and business model remain the same, without any personal connection to its customers or the neighborhood it serves. Oh, and he gets the girl, too. So that’s Zilch for the struggling independent female business owner and, what, Infinity+ for the corporate male stereotype? Not a model I’d want my kids to follow. 4. Lastly, one of the aspects of the movie I loved (and still love) was the circle of friends Meg is surrounded by at her bookstore. She has loyal employees who are also her trusted friends and many delightful scenes grow from their daily interactions at the shop. Once the store closes, and Tom swoops in to start building a friendship with Meg, her friends are rarely if ever seen again. Her life seemingly becomes full only of one relationship. No more humorous banter with other women or contemplative discussions about her late mother’s memory. Instead, we just get Meg talking over her romantic life with Tom until he reveals himself to be her online friend/lover and they kiss. That is, by the end of the movie Meg has lost her shop, and in that a significant physical connection to her mother, and seemingly her circle of friends, all to be replaced by Tom’s presence in her life as all that she really needed. Yeah, this time around I saw that final scene in the garden where Meg is crying and saying “I wanted it to be you so badly” in an entirely different light. Romantic Comedies included . . . Thanks for the re-post Angie! You are welcome. Thank you for the blog. I can relate to that. I loved it. Thank you! Having kids means life is never boring!